Pump 55 gallons in 90 seconds with two-way pumping action! 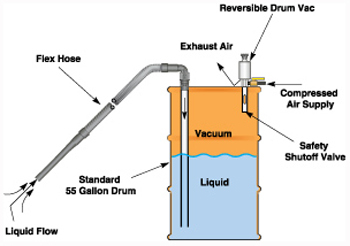 A compressed air operated reversible drum vacuum will attach quickly to any closed head 30 or 55 gallon (45 imperial gallon) drum. Its high powered vacuum fills the drum in less than two minutes. With the simple turn of a knob, the same stainless steel pump quickly empties the drum. Coolant sumps can be easily refilled, floor spills vacuumed, or contaminated liquids transferred to filtration tanks in minutes. The flow rate in and out of the drum can be controlled with the knob, making it ideal for dispensing liquids. Electrically operated "all purpose" vacuums aren't designed for use in industrial environments. As a result, motors wear out quickly and impellers clog. Compressed air drum vacuums do not use electricity and have no moving parts, assuring maintenance free operation. An automatic safety shutoff valve will prevent spills or overfilling. To learn more about reversible drum vacuums,click here.